In this podcast, Ricardo talks about the fear of failure. He explains that within the project environment we are not in a comfort zone and easy things doesn't need to be managed. Ricardo also said that failure is always part of the process and is also part of the DNA of the project, but who has a fear of failure can not manage projects. Inside the possibility of failure is that we project managers earn our life. 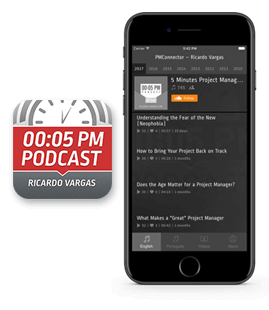 In this podcast, Ricardo talks about the execution of multiple projects simultaneously and using the same resources, ie multitasking. He explains that we often think that sharing resources across multiple projects can generate the perception that work is evolving, but this can cause delays and loss of quality in work. Ricardo suggests that it is better to concentrate efforts on one project at a time than to do all at once.